Parenting is probably the hardest – and most satisfying – job that any of us will ever have. Like any job, it comes with its share of stress. During the school year the stress level may ramp up, considering that many parents work long hours or more than one job to make ends meet, while also needing to keep tabs on their children’s academic progress and activities outside of school hours. Sometimes, the stress can become overwhelming. Experts say that the symptoms of stress include sleep problems, poor concentration, difficulty making decisions, increased use of alcohol, caffeine or drugs, and even physical illness. Both parents and children suffer when stress gets a foothold. Have a support network. Receiving support from other parents can be an excellent way to reduce stress, as you get to know each other by sharing experiences and ideas. Also, you can volunteer for various functions or programs at school, enabling you to become better acquainted with teachers and administrators. In addition, regularly call on family and friends to be sounding boards. The objective is to have a support network that you can turn to when you feel stress mounting. Get moving. Exercise is one of the best ways to relieve stress. You may not feel like exercising before or after work, but the effort can be worth it. Brisk walks, bicycle riding and swimming are all ways to get the regular exercise that can help keep you physically fit. By asking the kids to join you, the family togetherness can enhance the stress-busting effect. Just say “Om.” Relaxation techniques such as meditation, guided imagery, deep breathing and yoga are all ways to de-stress. You’ll build a reservoir of calm that will allow you to face all kinds of challenging situations, not just the stresses of the school year. Choose to snooze. Pay attention to your sleep habits, particularly at times of stress. Adults should have approximately eight hours a night, experts say. If you have trouble sleeping due to stress, ask your doctor for advice. By keeping to a routine for sleeping, you’ll show your kids good, healthy behavior. They too need rest, to keep pace with the demands of school and activities. Pleasant pastimes. Another stress-relief tip is to find a hobby, any hobby. Whether it’s gardening, woodworking, crafts, reading or keeping a diary, an activity that shifts your focus away from worry will promote calm. Think about sharing your hobby with your kids as a way of enjoying extra family time. Remember romance. 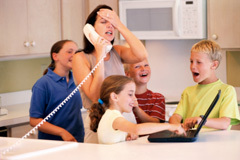 Stressed-out parents need to find time to reconnect. Having regular date nights is worth considering, as are lower-cost activities such as the movies, bowling, a walk in the park, or even window-shopping at the mall. Give yourself a break. Enlist family members to baby-sit or to take your little ones on an outing so that you can have a break. Ask your older kids for extra help with chores around the house. When at work, ask co-workers for assistance if you get overloaded – you don’t need to bring job stress home. What stress-relief tip works best for you? Share it with us in the “Comments” section below.